Brisbane performance group 'Guys n' Dolls Revue' are gearing up to present the musical 'Showtime', in an effort to raise funds for the Daniel Morcombe Foundation. The entertaining show, held at Eventide Auditorium in Brighton on Sunday, July 17th at 1pm, boasts a talented cast of 25 performers. Locals are invited to 'the boldest and brightest show ever', in support of the cause. Guys n' Dolls Revue producer Christine Young said locals who attend would not be disappointed. "It will be a great show with a blast of color, song and dance with Magic, Myths & Mystery, Music thru the Years, Rio Carnival and comedy items" she said. 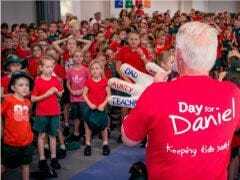 Ninety per cent of the proceeds from tickets will be donated to the Daniel Morcombe Foundation. Adult tickets are $25, concessions are priced at $18 and children under twelve are charged at just $10.